I mainly investigated the interactive computer graphics as part of my diploma thesis "GPU based simulation and visualization of fluids with free surfaces". The thesis makes use of the Lattice Boltzmann Method (LBM) to simulate a free surface fluid. 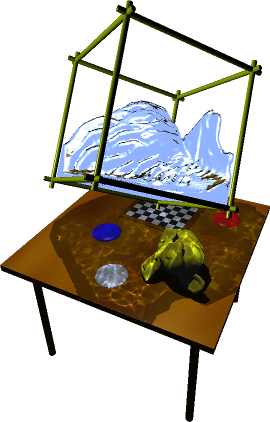 The fluid simulation was developed with OpenCL and runs entirely on the GPU - optimized for NVIDIA graphic card (NVIDIA GPUs are so far the only known GPUs where the program can run on). There are also a bunch of Videos. You can also download the source code. A program documentation for they GUI and the keystrokes also exists. You can also download my Diploma Thesis (PDF) (about 20 MB). Screenshot of online visualization and simulation of free-surface fluid.